MANILA, Philippines (AP) — Chinese President Xi Jinping said Tuesday negotiations between Beijing and Southeast Asian nations on a nonaggression pact to prevent clashes in the disputed South China Sea could be concluded in three years and promised that any differences will be dealt with peacefully. 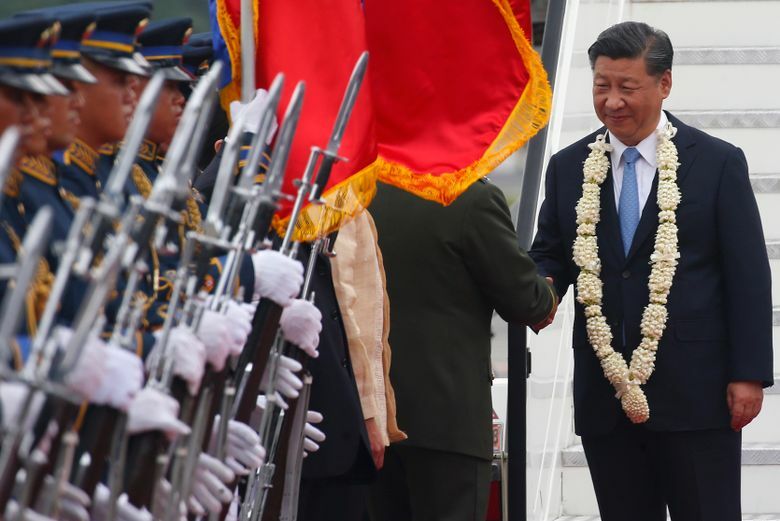 Xi made the assurances after holding talks with President Rodrigo Duterte and other officials on a visit to the Philippines aimed at deepening relations with the American treaty ally. 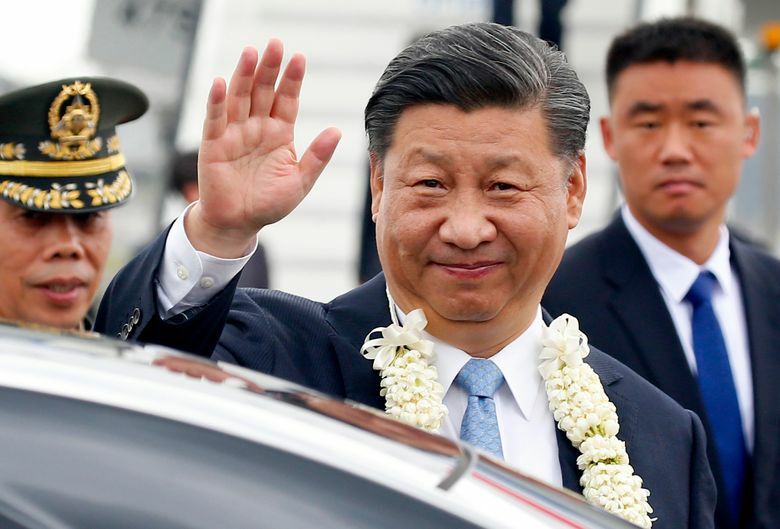 Xi’s overnight visit to the Philippine capital, Manila, was his last stop on a three-nation swing through Asia, where he has offered infrastructure loans and aid and championed free trade amid a rivalry for regional influence with the United States. “We will continue to manage contentious issues and promote maritime cooperation through friendly consultation,” Xi said. He said China aims to conclude the talks on the “code of conduct” in the disputed waters with the Association of Southeast Asian Nations within three years. 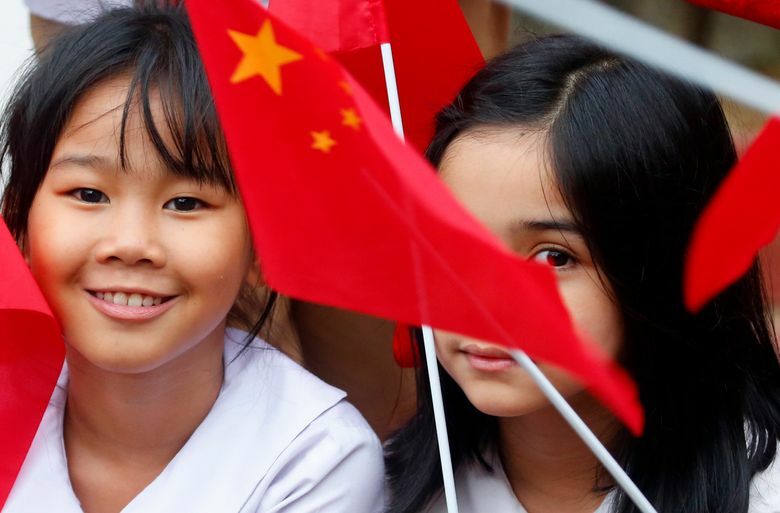 Four members of the 10-nation bloc — Brunei, Malaysia, the Philippines and Vietnam — along with China and Taiwan have overlapping claims in the South China Sea. Many fear the long-simmering disputes could spark an armed conflict that could shatter Asia’s bustling economies. 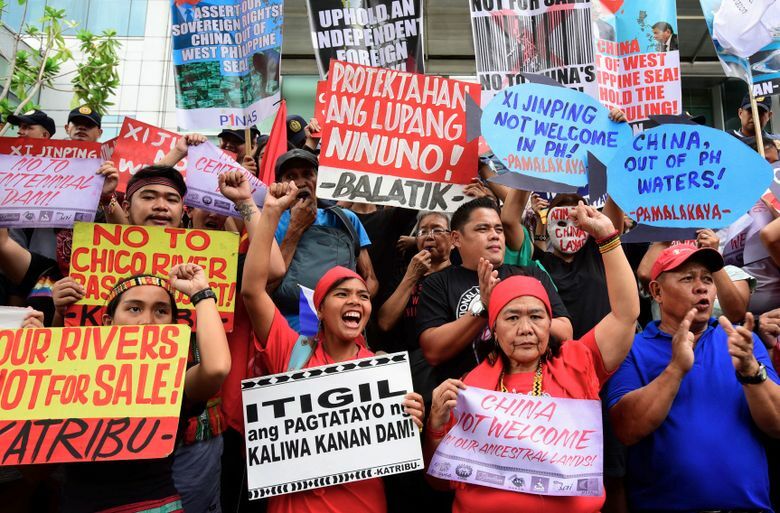 Ahead of Xi’s visit, China and the Philippines tried to negotiate an agreement allowing joint oil and gas exploration in the disputed waters, but apparently did not reach a consensus. They signed a “memorandum of understanding on cooperation on oil and gas development” on Tuesday but officials provided few details. “It’s a cooperation to find ways to find a solution,” Philippine Energy Secretary Alfonso Cusi said of the agreement. China has sought a “maritime and air liaison mechanism,” an arrangement for forces of the two countries to coordinate their naval and aircraft movements to prevent incidents in the contested waters, but the proposal has been opposed by Philippine defense officials, two Philippine officials told The Associated Press. There was no mention of the pact after Tuesday’s meetings. 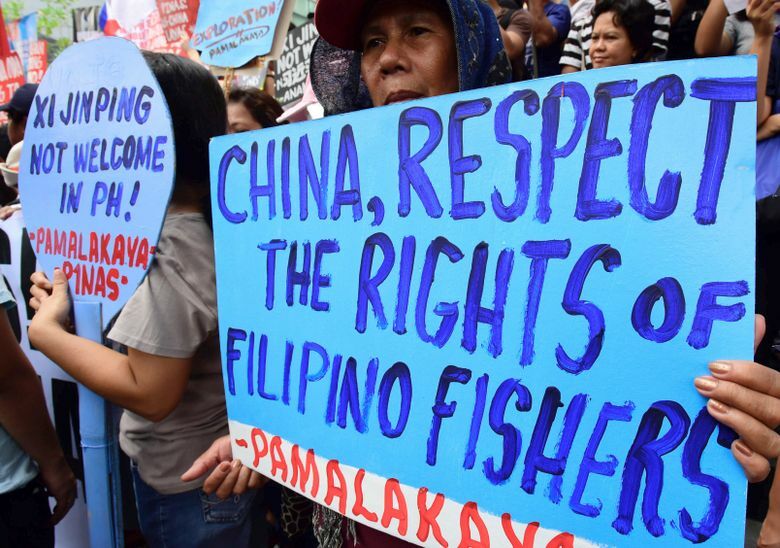 Filipino nationalists have warned that any agreement that can undermine the Philippines’ internationally recognized exclusive rights to fish and exploit resources within 200 nautical miles of the country’s coast would violate the Philippine Constitution. Beijing’s relations with Manila deteriorated over the territorial rifts until Duterte won the presidency in mid-2016 and sought to rebuild ties with China while criticizing U.S. security policies in a dramatic pivot. The administration of Duterte’s predecessor, Benigno Aquino III, had brought the territorial disputes with China to international arbitration and won, but China has ignored the outcome. Duterte has refused to immediately demand Chinese compliance with the ruling, which invalidated China’s sweeping claims to the waters, where Beijing has transformed a string of disputed reefs into missile-protected island bases. Duterte’s rapprochement has fostered a new era of warmer relations with the Asian economic powerhouse, from which he has sought trade and investment, infrastructure financing and weapons to fight insurgents. While Western governments have sharply criticized Duterte’s brutal crackdown on illegal drugs, China has not. Both Xi and Duterte have often been in the crosshairs of human rights groups. 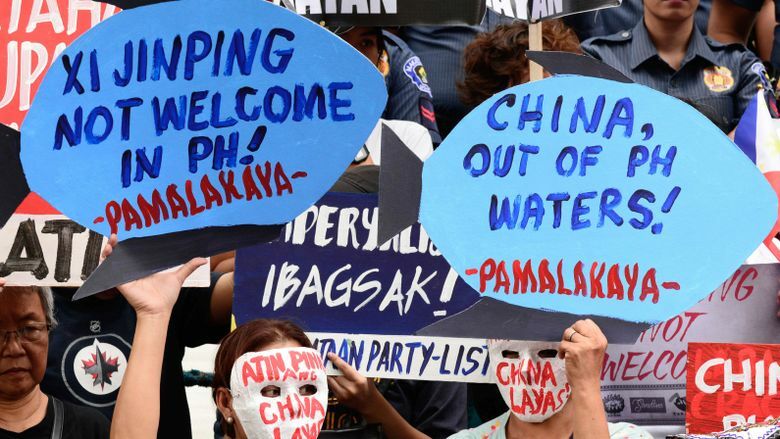 More than 300 protesters with placards reading “Hands off our land and seas” rallied in front of the Chinese Consulate in Manila. Another group of protesters later burned mock Chinese flags near the presidential palace, where Xi and Duterte met. Duterte said Philippine participation in Beijing’s “Belt and Road Initiative” was discussed and Xi invited the Philippine leader to attend the infrastructure loan program’s second international forum in China next year. Aside from their trade disputes, China and the United States have wrestled over Beijing’s assertive claims to the South China Sea. Chinese officials have asked Washington to back off from what they say is a purely Asian dispute, but the U.S. has vowed to maintain a presence in the waters, where it has no claims but has pledged to promote freedom of navigation and overflight. “We will continue to fly and sail wherever international law allows and our national interests demand; harassment will only strengthen our resolve. We will not change course,” U.S. Vice President Mike Pence said at a meeting last week in Papua New Guinea that was attended by leaders of the Asia Pacific Economic Cooperation forum, including Xi.